The late Xavier Perrot specialized in interactive multimedia and hypermedia for museums since 1990. 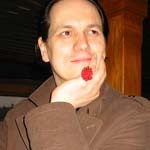 He held a Ph-D in “Production des hypermŽdias et des interactifs multimédias pour les musées” from the University of Paris, where he lectured at the Hypermedia Department. Perrot also taught at “École du Louvre” and “École Nationale Supérieure des Beaux-Arts” in Paris. He served as a consultant for cultural interactive projects, museum multimedia production and management studies, such as MAGNETS for the European Commission.